Long queues at Heathrow for Border Control are getting a lot of news coverage, and there are fears this is damaging the reputation of Heathrow. Some claim even damaging the reputation of the UK. Fast Track passengers – in many cases business passengers who are considered as vital for the British economy – also often have to queue for up to half an hour. The Border Force has agreed a series of performance targets with Heathrow setting out the maximum acceptable queuing times. Immigration controls are not done by BAA itself, but by the UK Border Agency. The UK Border Agency gets about 35 – 40% of its funds from fees (visa charges, permits etc – not from the airport or port), the rest is paid by the taxpayer. Quite how much border control at UK airports costs is not revealed. Civil service unions have predicted even longer queues if the Border Force presses ahead with plans to cut staff. The Telegraph says the number of Border Agency staff at airports will fall from 8,500 in October 2010 to 7,322 by April 2015. The Immigration Service fears delays could get much worse during the Olympics. Just how much the checks at airports cost the UK taxpayer is not revealed. In 2010-11 our immigration system and border controls are expected to cost around £2.5 billion. We will be reducing the cost to the taxpayer of the UK Border Agency by up to 23% over the next four years. [That implies the cost to the taxpayer is £1,600 m now]. However, while we are reducing our budget we will also increase the contribution that fees make to our costs to ensure that while the taxpayer pays less, the applicants pay more of the cost of running the agency. [See figures on Pages 35 and 37]. Each year we check more than 100 million people arriving at the UK border and consider around 3.5 million applications to visit, live, work or study in the UK. In 2010-11 we expect to seize around 3,000kg of class A drugs. We operate in more than 100 countries and in all the nations and regions of the UK. We currently employ around 23,000 staff and spend around £2.5 billion. Just how much the checks at airports cost the UK taxpayer is not revealed. The Telegraph (see below) says there are around 8,500 Border Agency staff employed at UK airports. That is around one third of the total. 1 Difference between gross expenditure and tax payer funding to be achieved through income generated from fees. (These fees are things like visa charges and work permits to work, stay or settle in the UK. There is detail on these fees at UK Border Agency Fees from 06 April 2012 ). So the % of total expenditure paid by fees is 38.8% in 2012/13 and 39.5% in 2014/15. The rest comes from the taxpayer. If the total expenditure in 2010/11 is around £2.5 billion, the decline by 2014/15 is around 15%. To be fair, the UKBA does more than just protect our borders and so it may be unjust to charge all its running costs to international travellers. The UK’s larger airports do pay towards their own police costs. Not border control. For example, Stansted paid £7.0m and Heathrow £28.3m for policing in 2010 (latest available figs). The FT reports that airlines using London’s Heathrow airport would pay higher landing fees to help sort out Britain’s border chaos under a plan backed by David Cameron. They say BAA is studying the proposal, which foresees airlines funding extra Border Force staff through the charges they pay BAA. 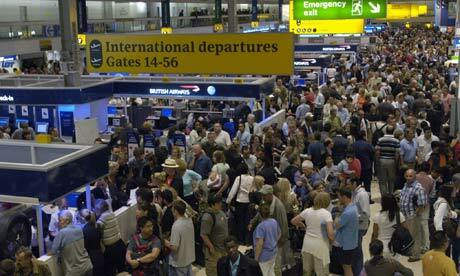 The Government believes airlines should meet a share of the cost of cutting the immigration queues. “The real answer is to get the airlines to pay for more security – that’s the long-term answer.” BAA levies annual landing charges worth more than £1bn on airlines at Heathrow to pay for infrastructure investment, including some equipment at the border, such as e-passport gates. The landing fees could help to pay for additional Border Force staff. Willie Walsh has said airlines would be prepared to pay for the right service but not if the government was wasting money. Meanwhile some Border Agency staff were flown from Manchester to Heathrow, to cope with delays. Air Passengers are being forced to wait up to an hour and a half to get in to the UK as the Border Force routinely misses its daily targets for queue times. Figures obtained by the Daily Telegraph, covering the first two weeks of the month, have revealed the extent of the chaos faced by people flying into Heathrow. Immigration Minister Damian Green was told he will have account for the chaos when he appears before the Home Affairs Select Committee and explain the chronic queues that are doing “huge damage” to Britain’s reputation. There are fears that the problems are tarnishing the UK’s image, particularly with the London Olympics only three months away. The Border Force has agreed a series of performance targets with Heathrow setting out the maximum acceptable queuing times. For passengers from outside the European Economic Area – the EU along with Switzerland, Liechtenstein, Iceland and Norway – the threshold is 45 minutes. Britons and holders of other European passport holders fared somewhat better, but on four days out of 15, the Force missed its 25 minute target for queues, with passengers left waiting of up to three quarters of an hour. Fast Track passengers – in many cases business passengers who are considered as vital for the British economy – fared considerably worse, with the target of 30 minutes missed on nine days. According to these figures, there was not a single day in which the Border Force met all its targets for all three categories of passenger. Even this extended snapshot could be an underestimate of the chaos inflicted on the travelling public. Worse problems occurred on a number of occasions last week, with Terminal Five, which is used by British Airways, reporting delays of up to two hours. Civil service unions have predicted even longer queues if the Border Force presses ahead with plans to cut the number of staff from 8,500 in October 2010 to 7,322 by April 2015. The Immigration Service Union has voiced fears that delays could reach more than three hours as tourists flood into Britain over the summer ahead of the Olympic Games. Anger has been growing among airlines at the delays their passengers are facing. “If the Government wishes to pursue more stringent immigration checks then it must adequately resource the UK’s borders to be able to cope during busy holiday periods and events like the Olympic and Paralympic Games,” said Steve Ridgway, Virgin Atlantic’s chief executive. The Board of Airline Representatives in the UK, representing 80 carriers, has described the immigration queues as a national embarrassment. Theresa May, the Home Secretary is due to meet airlines within the next few weeks to discuss the delays. Yesterday Keith Vaz, chairman of the Home Affairs Select Committee, announced plans to call Immigration Minister Damian Green after reports of lengthy delays to get past passport control. Mr Vaz said the issue was of “great concern” and needed to be addressed irrespective of the Olympics. “Huge damage is done to our country’s reputation,” he said. ……. a large number of overseas visitors are shunning expensive flights into Heathrow and flying into Britain’s regional airports. Flight bookings into Manchester and Glasgow during the Olympic period have risen by 40 per cent compared with the same two weeks last year. “There are better flight prices, and people are then travelling down by train,” he said. MPs on the Home Affairs Select Committee say they plan to question the immigration minister about the issues in May. The date for Mr Green’s appearance before the select committee is to be announced. The suggestion has been made that before long Government should decide to charge airports for immigration services in much the same way that is done for supra-normal levels of policing. I like that idea – it means that, in the end, those who generate the extra requirements will pay for them to be met. Are we to draw the conclusion that the BAA is so bad at setting up and running an airport that the UK Border Control is unable to perform its job properly? Maybe the BAA should be looking in a mirror instead of making worldwide publicity about how badly the UK is treating its visitors. In any case, the way they are posturing you’d think that Heathrow alone is the face of the UK. Posted: Saturday, April 28th, 2012. Filed in General News.